For my books, see BROWDERBOOKS below. A self-appointed heir to the throne of Byzantium who for his coronation wanted fifty Vestal Virgins, but settled instead for Andy Warhol, a boa constrictor, and an ape. A male movie star whose New York funeral caused an all-day riot. An opera house manager who feuded with Maria Callas and told a disgruntled tenor to bite a soprano's ear onstage. They're all forthcoming. I've got them in hand, will announce them next week. Some of them are fun, some are astonishing, some are frightening. Just after dawn on a recent Friday a truck pulled up at Bryant Park, the park behind the New York Public Library on Fifth Avenue between West 42nd and 41st Street. The truck's back door then opened and a great buzzing was heard, for stacked in the truck were boxes containing 9 million bees. This was an annual rite of spring in the city, the delivery of bees from Florida to the beekeepers of the city and its environs, and they flocked (the beekeepers, not the bees) to claim their purchases. Once banned (but practiced furtively), beekeeping became legal again in the city in 2010, and since then it has become a popular pastime. Of the truck's 9 million bees, 3 million were sold in Bryant Park. By car, train, bus, and bicycle, the keepers carried their spoils off to replenish their apiaries. And where are those apiaries located? On rooftops (including a church in Chelsea), in small backyards, and in some cases even indoors. Many of the beekeepers had lost their bees because of last winter's fluctuating weather, but one keeper from a rural area said that bears had killed his bees last spring. The bears ate the honey and killed the queen bees, and their death meant the end of the hives. To avoid another such disaster, this year the keeper is using elevated hives. But many of the bees stay in the city, and I've bought their honey in the Union Square greenmarket at Andrew's Honey, where Andrew boasts of honey that is locally produced. So even if the season is afflicted with chilly weather and gale-force winds, the bees and their keepers insist that it is spring. Source note: This Small Talk is indebted to Corey Kilgannon's article "Beekeepers' Rite of Spring: Replenishing the City's Hives," in the New York Times of April 14, 2018. To describe my visit to the 9/11 Museum requires a lengthy preface to explain my relationship to the World Trade Center site. Frankly, I never had much use for the Twin Towers. Architecturally, they struck me as two big boxes jutting skyward, void of grace and style. And I agreed with those who said they weren’t really needed, but were built simply because it was possible and therefore should be done. And if I’m not mistaken, they never filled up completely, always had room for tenants who never quite seemed to appear. My one foray into one of them, to get some tax forms from a New York State office, involved changing elevators halfway up and left me indifferent to their height and significance. My partner Bob, on the other hand, took his mother more than once to the Windows on the World, the restaurant on the 107th floor of the North Tower, and raved not about the food but the view, which was said to extend for ninety miles. My conclusion: the towers were acceptable if you were at the top looking out and didn’t have to look at the towers themselves. Yet for all that, the Twin Towers insinuated themselves into my daily existence. Visible from my south-facing bedroom window, they were the last thing I saw at night, when I pulled the shade down, and the first thing I saw in the morning, when I put the shade back up. If they were clearly visible, I knew the day would start off bright and sunny. If they were somewhat blurred, I anticipated fog or maybe rain. And if they weren’t visible at all, it meant heavy rain or possibly, in winter, snow. So it went for years. Then came 9/11. I had gotten up early to go look at migrating warblers in the Jamaica Bay Wildlife Refuge at Broad Channel, on an island in Jamaica Bay, Queens. I got there by a little before 8 a.m. and began walking around the West Pond, on whose edges I indeed found several warblers feeding at ground level and therefore easy to view. “Have you seen the World Trade Center?” asked a young woman who was walking in the opposite direction. “Yes, of course,” I answered, wondering why she asked, since one could always see it from a certain point that I had yet to reach. Farther on along the path I saw one of the towers – the North Tower, I learned later – emitting a huge column of black smoke. What a fire! I thought, but went on looking at the birds. Fires, even big ones, are common enough in the city and get put out in a matter of time. The North Tower, as seen from the Statue of Liberty. Perhaps a half hour later, having circled the pond, I came back to the point where the Twin Towers were visible. But now they weren’t visible at all, being cloaked in a huge cloud of smoke that the wind was driving slowly eastward over Brooklyn toward the ocean. Still, I assumed that this resulted from the fire I had seen before and found it only mildly troubling. Then another visitor told me they were shutting down the refuge, and subway service to Manhattan might be suspended. Now at last I realized that this was more than just a fire; it was an emergency affecting the whole city. Worried about getting back to Manhattan, I went out to Cross Bay Boulevard to wait for a bus to take me into Queens. A policeman came over and informed me that no buses were running across the bridge to Howard Beach and the mainland, so I started walking toward the bridge. One of the Wildlife Refuge staff driving that way in a car recognized me as a recent visitor to the refuge, stopped, and offered me a ride to Howard Beach. There I got out to find a telephone and ask my friend Richard in Brooklyn to come get me with his car. He came an hour later, and as we drove back to Brooklyn he told me that both towers had been hit by planes and collapsed. Richard dropped me off at a subway entrance where we saw some people entering, but when I went down to the platform to wait for a train, I and other hopefuls heard a PA system announcement that no trains were running to Manhattan. So I was trapped in Brooklyn. Walking to Richard’s brownstone, I explained my situation. He let me phone my partner Bob to explain that I would have to spend the night in Brooklyn, and then invited me to join him and several other friends for an impromptu dinner, following which another friend put me up in a guest room for the night. The next morning I was able to get back to Manhattan by train. I got off at a station within the so-called frozen zone, all of Manhattan below 14th Street that was now closed to the public, except for first responders heading downtown, and residents who lived inside the zone. As I walked through the West Village, there were no cars driving on the streets, and an eerie silence prevailed. Back in my apartment at last, I could see from the south-facing windows a blurred mass of smoke where the Twin Towers had once been visible. The wind had now shifted in the direction of Manhattan, bringing us a burnt smell that persisted for days, sometimes so strong that we had to shut the windows. Gradually the smell subsided, and the frozen zone was reduced in stages, until it was confined to only the area around Ground Zero, the site of the attack. For weeks to come, whenever I took a walk along the riverfront, I would see people holding up signs that said THANK YOU and other messages of gratitude intended for any vehicle – police, fire department, or whatever – heading downtown to the site of the attack. Often the driver of the vehicle would sound his horn in response. This went on for weeks. 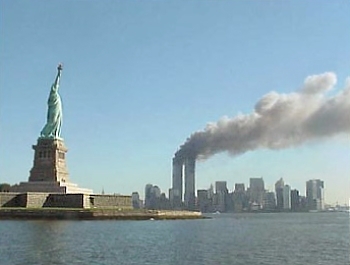 I had witnessed the 9/11 attack only from a distance, but others were not so removed. A woman I knew lived high up in a downtown apartment from which she could see people who, trapped in the blazing towers, in desperation leaped to their death. This sight was avoided by the media, but it was implanted in her mind and horrified her for days to come. And another friend of mine was dismayed to learn that her family heirlooms -- jewelry passed on to her by her mother and grandmother – had been destroyed in the bank vault where she had deposited them long before, thinking a vault at the World Trade Center the safest place imaginable. In time her bank informed her that it had been able to access the vault and recover its safe deposit boxes, which had miraculously survived the attack. All her jewelry was intact except the pearls, which the intense heat of the fire had dissolved. Of course the Ground Zero site would be rebuilt, but the process dragged on for many years, complicated by the conflicting needs and wishes of the many parties involved. I often despaired of the whole business, until tangible results were achieved. Through my south-facing window I could at last see the Freedom Tower, which at night appeared all lit up, with an antenna mounted on its roof and topped by a blinking red light; I christened it my Tower of Light. As for the recently opened 9/11 Museum and Memorial, I heard good things about them and recently, quite on the spur of the moment, decided to visit the museum. Ground Zero as seen from above, 2011. Just because these remarkable buildings and the Freedom Tower have been completed, don’t imagine that the site is all tidied up and presentable. When I exited the E train terminal on Church Street near Fulton, the first thing I saw was the graveyard behind the St. Paul’s Chapel – not the graveyard I was meaning to visit. And just across Church Street was a huge construction area blocked off and closed to the public. Only by following big signs posted at intervals was I able to proceed to the museum past areas still under construction and emitting loud screeches and roars and whines. On the way I saw, for the first time up close, the faceted thrust of the Freedom Tower stabbing skyward, and the Oculus, the World Trade Center Transportation Hub, which replaces the old PATH train station destroyed on 9/11: a strange thing looming squatly like a huge white mushroom or, as some would have it, a white dove spreading its wings and about to fly. But I had no desire to linger here or to explore the Memorial’s plaza and fountains, given the nippy gusts of wind and my entrance scheduled for 10 a.m., so I hurried on to the museum entrance. There, having bought my ticket online in advance, I was privileged to stand in the shorter line for ticket holders, as opposed to the long line for those numerous poor souls who had yet to obtain a ticket. Admitted inside at last, I went through security just as strict and vigilant as the security at airports, and was finally ready to explore the museum itself. Given the options of a tour with a guide or a do-it-yourself audio guide, I spurned both and elected to blunder forward on my own. Future visitors be warned: negotiating this labyrinthine museum requires an epic tolerance of darkness and crowds. Anticipating wonders and horrors, I left daylight and the museum’s ground floor behind and descended a very long ramp into the land of the dead. Arriving at a lower level, I saw a huge wall with square panels in various shades of blue and, in large letters, a quote from Virgil: NO DAY SHALL ERASE YOU FROM THE MEMORY OF TIME. This perplexed me until, squinting through the semidarkness, I deciphered a sign explaining that behind the wall were the remains of many who died in the attack. This, I later learned, was Memorial Hall, a reminder that the museum is, above all, a shrine to the deceased. Throughout the whole of my visit the hundreds of visitors were properly respectful and subdued, the only audible speech often being that of the tour guides to their groups. Proceeding from there, I found myself immersed in a darkness so total that I couldn’t see the floor in front of me and was afraid of stumbling over some unseen object and falling. So I went groping bravely forward with other visitors on all sides of me doing the same. Thinking to steady myself by touching a wall, I reached out and found … nothing! So I just kept pressing on. Carried along in the sluggish flow of visitors, I encountered two large twisted steel girders, remnants from the attack, that seemed frozen together in a frenzied dance. After that, an endless series of remnants, including the rectangular base of the steel box columns that had anchored the South Tower to bedrock. The damaged columns had been removed, leaving only these “footprints” of the tower. We were, then, on the site of the South Tower, the second to be hit. Visitors were quietly snapping photos right and left, but in a separate section labeled IN MEMORIAM this was strictly forbidden. Entering through a revolving door, I found myself confronted by a huge wall covered with photos and the names of the 2,983 people killed on 9/11 and in the earlier attack on February 26, 1993. There were three more vast walls with photos and names, and a separate room where you could sit quietly and hear those many names being read aloud by a recorded voice. Having left this inner shrine, I came upon what seemed like a towering and twisted 40-foot avant-garde sculpture, which proved to be a section of the South Tower’s ravaged steel façade. Down a side hall I found a display of the many New Yorker magazine covers celebrating the Twin Towers, followed by covers commemorating their destruction. Especially vivid also on the wall was a large photo of the looming towers, quite intact, with a cluster of white-sailed sailboats passing tranquilly in the river in the foreground. At intervals in this subterranean maze I came upon stairs and escalators that took visitors still farther into the depths of Ground Zero. Along the way benches were few and far between, and usually occupied by weary visitors, but I found a big one empty and promptly sat on it. Only when I got up did I see a sign explaining that this was a bench salvaged from the plaza of the Twin Towers after the attack. And just beyond that point I got a free museum map from an employee handing them out – useful now but useless at the time, given the lack of lighting. On ahead was the site of the North Tower, the one I had seen emitting a huge dark cloud of smoke. Here were exhibits that took me into an eerie world of wonders. What looked like a giant’s rust-brown headband topped by a tangle of spaghetti hair turned out to be a salvaged elevator motor. And across the way loomed what looked like a big sci-fi armadillo, or perhaps a deep-sea creature with an armament of protruding spikes: a segment, a sign informed me, of the radio and television antenna that once rose from the roof of the North Tower. Nearby, what bore the letters LADDER 3 was easy to identify: a Fire Department truck, one end savagely smashed. At some point in my subterranean wanderings I entered a large hall – the Foundation Hall, as I later learned – where a section of wall had been left exposed: a huge expanse of illuminated rough concrete with some kind of knobs protruding at regular intervals. Devoid of aesthetic interest, it impressed me only by its size. Later I learned that this was part of the “slurry wall” that ran around the World Trade Center foundation, protecting it from the surrounding water table. On 9/11 the wall strained under intense pressure from the water table, but held fast and prevented flooding of the underground subway tracks nearby, and maybe even the flooding of Lower Manhattan. And in that same Foundation Hall you see the so-called Last Column, a 58-ton steel beam ceremoniously removed from the ravaged WTC site in 2002 and inscribed with markings, pictures, and tributes by the recovery workers. Finally I entered a climactic exhibition that told the story of the day 9/11 hour by hour, with photographs of the burning towers, quotes from witnesses, and even recorded voices of people expressing their bafflement, shock, and horror. Especially riveting was a segment of film showing the second plane crashing into the South Tower, causing the tower to erupt into a huge fiery blaze consuming many floors below the top of the tower. The film lasted only two or three minutes and was constantly repeated. I recognized it as one made quite by chance by two young Frenchmen who happened to be out that morning filming in the streets. Though I had seen it before, like everyone around me, I simply had to stand there and watch it at least three times, registering shock each time at the moment of the crash. There was more in the exhibit ahead of me, but by now I had spent two hours in the darkened depths and, foot-weary, was eager to return to the world of daylight. Having long ago experienced the real 9/11 in my own way, I didn’t feel compelled to repeat it in its brilliantly reconstructed totality now. Seeing an exit door for those not wishing to continue, I pushed it open and followed a corridor to the foot of the longest escalator I had ever seen, and by this means ascended slowly and regained the world of the living. It was 12 noon. Should I go up to the top floor and lunch in the café? No, I decided to head home and collapse, having tasted the horrors of 9/11 to satiety. Someday, in sunny mild weather, I’ll return to see my Tower of Light up close, as well as the Memorial plaza and the supermodern wonders of the Oculus. But if, for me, two hours in the land of the dead had been enough, that land had been strange and fascinating. It had assumed in turn the atmosphere of a hushed shrine, an avant-garde gallery of tortured statuary, and an undersea grotto inhabited by weird and mysterious creatures that loomed in frozen silence. The 9/11 Museum is unique. Coming soon: Fighting New York City: Five Tips.